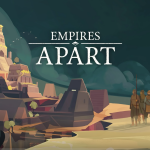 Empires Apart is a real-time strategy game developed by DESTINYbit for publisher Slitherine. The game is modeled after genre classics like Age of Empires 2, but implemented with a modern 3D engine. Speaking as someone who scored two RTS games of that era (Empire Earth 2 and 3) — and spent too much time playing them — it was great fun to return to such familiar territory. I wrote over a half hour of orchestral and ethnomusically-inspired score, including themes for ingame factions such as the Aztecs, French, and Byzantines. The game soundtrack is currently available as DLC on Steam, and includes all my music as well as a gorgeous opening theme written by Sean Beeson. An independent release in digital music marketplaces is planned for the not-too-far future.